How Impactful Can The ‘Design’ Element Be? Getting visitors to your website is similar to getting people to visit a restaurant or a luxury villa; the neater the place, more the visitors. A neat and optimized website encourages trust. Studies show that 84% of the searchers online will not make a purchase if they are dealing with an unsecured website. 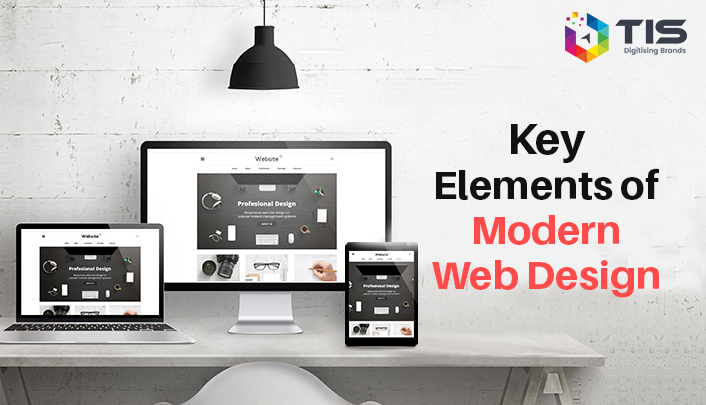 As the digital era progresses into 2019, there are key elements about modern web design that need to be borne in mind, to ace the web designing game. Below, you will find a list of those elements, explained in detail to make you realise of each crucial aspect of making a successful website. Minimalism may look far too simple but is the hardest to achieve. It is a simplistic layout minus the clutter. Some of the finest examples of exceptionally neat websites are Studiorotate.com and MikiyaKobayashi.com. The central idea of minimalism is to focus on just one thing about your website that you want your visitor to leave with and make it the most memorable thing about your website’s landing page. Hire the industry best web designers to make your website interactive that have better user experience, lesser bounce rates, stand out to give you an edge over competitors & have that wow factor can compel your visitors to convert. People usually do not enjoy reading online that much. They need more visual aesthetics, and fewer things to remember (simply because they already have so much to). When you focus your website on informative pictures and videos over text, plain typography, and a remarkable use of white space (in the examples you saw above) you end up garnering their attention longer, and it also helps in total recall value. Minimalism shifts the focus on a visual representation of what your brand has to offer, which is the crux of website designing. A peculiar font that is unique to you will go a long way in reminding people of your brand. If you look at the Coca-cola font, you can instantly make it out. Font has a large part to play on your website. Therefore, making it small would just make it unrecognizable. For people to recognize and remember the font on your site, make sure you showcase it on your landing page itself. If you see Sergey Makhno Architects (mahno.com.ua/en), you will see a geometric font representing their architectural expertise spilling into their website design. Unique and large typography add to the overall aesthetics of the website. Studies show that 38% of user will stop visiting your website if the layout is unattractive. And if the font does not match with the design of your website, your layout goes for a massive toss, which would reflect on your business sooner rather than later. Custom graphics have emerged as a new trend, and there is a specific way you have to go about it. The custom graphics you choose for your website has to be immensely unique. If you look at ToskaChocolates.com – a chocolate website from India, you will see a chocolate being peeled off its wrapper as you scroll down. This arouses the tasting sense of the user scrolling down the site, making the user want to buy the chocolate. Studies show that 75% of consumers make judgments about a company’s credibility based on the website design. Back in the 90s, when the Sprite’s curly haired mascot – Fido Dido – donned the television screens, it took the brand’s marketing charts off the roof. That is the power character design holds, when it comes to endorsing your brand over a virtual media. Smartphones are remarkably accessible. That is one of the prime reasons why 60% of consumers click on mobile ads at least weekly. The engagement and the traffic received by users on a mobile phone are far more than any other device. 80% of Smartphone users use their mobile device to access the net, and that shows how really important a mobile-friendly design is. Making the website responsive to various dimensions of mobile devices is crucial. The Hamburger layout for the menu tab is a good pointer in making the website more mobile-friendly. The Indian Clothes and merchandise brand TheSouledStore.com is a good example of a responsive website, which shrinks or expands as per the dimension of the screen of the device you access the site from. Opt for the best Responsive Website Design services in this multi-device world where in 83% of mobile users say that a seamless experience across all devices is very important. When there is a website that loads without any hassles on your user’s mobile device, you will notice that the user can spend more time on the site. And the obvious outcome of this would be a higher sales ratio. Statistics suggest that in the last quarter of 2017, close to 52% of all global web traffic originated from mobile devices. Hence, if there is a way your user can spend more time on your website, you should make the necessary provisions to make that happen. Hero images are huge banner images which are placed with the intention of grabbing the potential customer’s attention. They are supposed to be eye-catching and visible. If you happen to hide it behind text or a shabby clutter of menu options, then the hero image would lose its charm. Measponte.it is a prime example of how hero images should be placed on the website. The text should blend with the banner image in a seemingly seamless manner. Large and responsive hero images set the expectation right for the customer. They would not be expecting anything other than the products or the services you offer. Like Onirim.com does on its page, every image that flashes elicits a sense of vogue and panache. Having creative images flashing on your page would interest the user and make them keep coming for more. An important element in website designing is composition. It helps structuring your website’s layout. Even the best font and hero images and UI/UX would fail if your website’s overall composition remains to be a mess. The basic idea as per the Rule of Thirds or the Divine rule of Photography is basically aligning the pictures or texts on the site on the four focal points of six intersecting lines. It could be aligned on the two left focal points, or two right. On applying the rule of thirds, the page looks a whole lot organised and appealing. The font and the pictures do justice to what it is deemed to accomplish. If you see MarcusSchramm.net website, you will see the rule of thirds being applied incredibly, making the landing page look harmonious and a safe site to be at. For those of you unaware of what white space is it basically is the negative area in any composition. An unmarked distance between two objects that ends up giving the viewer a sort of visual break, by minimizing distractions and making it easier to focus on the subject at hand. If you check out the website Welikesmall.com, you will notice white space used in a video format, where their homepage displays a demo reel of their recent video projects. This manages to attract the attention of the viewer. They have added the call-to-action button at the centre, with nothing much around it, giving it all the space on the page to be visible to the viewer. Undoubtedly, this would make the viewer click on the button and check out more things on the site. White space enhances usability, and that is found to be one of the most sought after characteristic of a website as per a survey conducted in the United States. 60% of the respondents have agreed that they prefer usability. Pair usability with aesthetics and what you have is a fabulous website. A short video regarding the product you offer or services you provide livens the page up. The Website Watson.la is an impeccable example of this. They use white space and short videos, with hero images and amazingly contrasting colors in such a wonderful manner, that you cannot move away from the charms of the site. A feature video enhances the user’s experience. As we already are aware that video content is currently the most sought-after form of content. Cashing in on this potential is undoubtedly a good option. A video is the most attractive form of content and since it just 2.6 seconds for a user’s eyes to land on the area that most influences their first impression, grabbing their attention hook, line and sinker through a video is a sure-fire method. Background videos are innovative alternation to hero images or banner images. If your brand deals with videos, then this would be the best approach to follow. It basically is a stream of videos playing in the background of your site header, making the page come alive. Techyscouts.com is a prime example of a background video constantly in motion. This breaks the monotony of a static landing page, making the website all the more memorable. A background video adds attractiveness to a rather motionless website. It sometimes just takes 17 ms to form an opinion about a website. In order to make this super fast formed opinion tilt in the direction of your site for longer; using an interesting background video would benefit your site. Being very distinct about what you are selling is the key to an effective website. Genesis.com understands this, as you can see a giant product image making up the most of the landing page. Also, if you minutely observe, it also applies the Rule of Thirds and Negative spacing has been effectively used to contrast the color of the car. When a product is displayed through a giant image, the highlights of the product are highlighted. This reinforces the benefits that come with the product. The end user understands exactly what is happening on the page, and the product receives total and undivided attention of the user – which, by the way, is the ultimate goal of a neat website design. The call-to-action is pivotal in encouraging engagement. For you to get maximum interaction from the user, you have to focus on the button. Do not hide the button within too much design. The entire motive of minimalization and using adequate white space is to enhance the appearance of the call-to-action button. The call-to-action button is everything your website design works toward. If the design of the website has impressed the user enough, they will click on the button to venture deeper into your site. That is your one shot to generating leads. Make sure you do not miss out on this. One of the most innovative call-to-action button is the one shown by Ultranoir.com, where in the image is water-like, and reacts to the pointer. It tempts you to take action, just to see where it leads you. The page it eventually leads you to, is amazingly contrasted and innovative designed. Everything online will pay off only if you make it visible to the search engines. If the search engines are unable to find your site, all your aesthetic efforts value to nothing profitable. Basically, SEO is a set of rules to follow while designing a site. The most important motive of SEO is to make the site a comfortable experience for the end user. The guidelines to SEO are centered on user-friendliness. The aspects of effective SEO include adding Meta tags, title tags, heading tags, etc. Consider hiring a team of expert SEO consultants who carve to provide an awesome SEO service experience with a blend of social signals & content marketing efforts. SEO helps bring your site to the light of the day. If you have managed to crack it down to the core, then you would see that whenever the user types the keywords you have used, your site would pop up immediately. With an aesthetic site that has everything pleasing to offer, right from font artistry to visual aesthetics and on-point content, you can be rest assured that the user will keep coming back to your site. Colors have a lot to do when it comes to adding to the aesthetics of a website. After all, it is what enhances the visual appearance of the site. You have to wrack your brains to understand the nuances of colors and predict interplay between them to suit your site. Adding too many colors would make your site seem shoddy, and the user, most likely, may not return. Using just a few, but thoroughly planned out colors, would enhance customer experience, making them want to keep coming for more. Using different shades of the same hue can make your website appear subtle and pleasing to the eyes. Bambora.com is a good example of this as you could see that every aspect of the site is in a purplish hue, including the call-to-action buttons. A well-colored site like this falls easy on the eyes of the viewer, and earns you enough brownie points that the end user plans on visiting again. SVG graphics or Scalable Vector Graphics are a designer’s main tools these days. They amp up any website to be far more than what it can be. These graphics make the website come to life. One such brilliant example of a website that has extensively used SVG is Waaark.com. Every aspect of this website reeks SVG and it is so enthralling an experience that one does not feel like leaving the site. Hire an expert graphic designer who can effectively communicate your intended message through visuals given form and structure, where by visual information is so as to communicate your unique message and reflect your unique identity. SVG makes the user stay on the site longer than they intended to be. This extended stay on the website, if encourages regularly, would lead to definite sales over time. A website studded with graphics leads to better leads generation and sales turnovers. Easy navigation is a definite lure to non-tech savvy niche of your audience. It may be hard to believe that such a niche exists in today’s era, but it does. And as a website designer, you have to keep such a niche of people in mind too. Apart from these, simplicity is often appreciated. It may be the hardest to achieve, but the results are sure. Easier navigation encourages audiences to visit your site often, as they know their way around and would not be lost finding the things they were looking out for in the first place. If you look at DinamicaPlataforma.com, you will see an easier navigation panel with interesting animations that make you want to visit the site again. Easy navigation menu creates the first impression in the mind of a person visiting your site for the first time. They account for 94% of the total first impressions. You can therefore analyse the impact an easy navigation menu would have on the traffic flow on your site. When one uses imperfection on the design; the design takes the form of art. Gone are the days when proper, inorganic shapes made the cut. These days imperfection is celebrated, and that is adding all the aesthetic value to the websites. If you visit the website MakeMePulse (2019.makemepulse.com), you will see the loading bar to be a crooked line representing the nomadic feel, which is exactly what we are talking about. Without many efforts, just this small artistic touch renders a rustic feel to the whole website. Organic shapes are an oddity. And the best part about oddities is that they stand out. Something that stands out in business is what sets you apart from the competition and therefore has better recall value. Your customers would instantly remember any aspect of your website the moment they see the slightest of glimpses. Social media integration is a pivotal part of every website out there. Social media can be approached in a way that suits your brand and the products you offer. If you have fashionable and glamorous things to sell, visual platforms like Instagram and Snapchat could come in handy. There are various tools that aid social media integration in a funky manner, to make your website appear neat and simplistically awesome. Multinational companies like Nike, Dolce and Gabbana, Adidas, etc. that always have to be deeply integrated with social media could guide you the best on how they integrated social media on their site in the most seamless fashion. Hire the best social media consultants who can offer ultimate solution to all of your social media marketing problems, thus helping you get your word out to a majority of people, in fact your word will get out to more than half of the world’s population, who is using one or other platform of social media. A staggering amount of people are glued to their mobile devices. And much to no one’s surprise, they are massively surfing some social media platform or another while they are at it. There is extensive research being done on this, as to why the relationship of people with their phones seems to evolve. That being said, if social media integration is done accurately, it makes your website more engage-worthy, and increases the chances of you making more sales eventually. People who are on your site for information would appreciate if you provide it to them readily. Dispersing information across your website is a hassle for the “Infosnacker”. To beat this, use the Hamburger menu, which usually is seen as three lines stacked up on each other on the top left or top right of the site. This stack of lines bind the menu in one small space, giving your website enough space to display pictures and videos and enhance the aesthetics of the site. Almost every popular website these days uses the Hamburger menu to make navigation easy for the user. Nike has done some great work when it comes to creating custom digital illustrations. To stay true to their ethos, and the comfort their products offer, they have made whacky animatronics, thereby making use of complete creative liberty. You can see it for yourself here. This website also makes fabulous use of the Hamburger Menu. When custom illustrations are used, there is a better chance of people relating to what you offer. Custom illustrations manifest the virtues of your brand and lead to the creation of a better recall value, which the audience will never forget. Know that your audience’s attention span online is less than a couple of seconds. In fact, studies reveal that it is less than 50 milliseconds. That is all the time you have to impress your audience. That cannot happen if your site takes that much time to just load. You have to figure out a way where you site loads faster than a blink. An easier way to go about it is to include images with lesser weight so that your load time lessens and sites load faster. Getting a dedicated server space instead of a shared server would also boost up your load speed incredibly. Speed-optimization impacts your website design. Your viewer will like the design only if they reach to it fast enough. In case they don’t, they will bounce off your site and you will have a higher bounce rate which will lead to poor SEO rankings and eventually spiral your site down to the void of oblivion. All that effort you put into making a site should never face a fate like that. NFL.com is known to be one of the fastest loading sites. These essential mandates are what contribute to making a website effective and efficient, and aesthetic at the same time. A holistic website that offers functionality and design is revered by many and visited by many more. If you lay the foundation of your website keeping in mind these aforementioned criteria and sticking to them down to the core, there is no doubt that your website will thrive in a span of mere days or even hours. In 2019, sticking to the basics is in trend. And following these tips would basically uplift your online business to the heights of success like you never imagined. Mobile UX Optimization – Top 4 Tips to Learn for Better User Experiences!! Web Design Niching: Bane or Boon?